In this tutorial group, we are reflecting on the Gospel readings for the Sunday after next. The Sunday after next [5 March 2017] is the First Sunday in Lent. The readings in the Revised Common Lectionary are: Genesis 2: 15–17; 3: 1–7; Psalm 32; Romans 5: 12–19; and Matthew 4: 1–11. Unless they have pancakes in the canteen at work next Tuesday, or resolve (yet again) to give up smoking next Wednesday, I am sure many people will not notice that next Wednesday is Ash Wednesday and the beginning of Lent. Giving up smoking on Ash Wednesday is one of the few Lenten resolutions that survive in Irish society. But even as I was growing up, Lenten resolutions were broken and forgotten as quickly as New Year’s resolutions. How many of us promise on New Year’s Eve to give up smoking, to drink less, to cut out sugar or to lose weight? How many of us can remember our New Year’s resolutions for this year, never mind those for 2016? Lent originally began as six weeks of preparation and instruction for the newly-converted Christians before their baptism, before joining the Church, on Easter Eve. Lent should still be a time of preparation for our ministry and mission. And the temptations or distractions that take us away from that mission and ministry are similar to those faced by Christ in our Gospel reading this morning. The movement is from the particular to the general. As readers, we are challenged to move from the temptations that affect our own lives to temptations that have consequences for the lives of those around us, and then to temptations that concern the world we live in. It is a dramatic movement from my own life to the spiritual lives of others, and then to the social, economic and political life of the world. It is a stern reminder that there is no such thing as personal sin unless there is also social sin. TS Eliot’s play Murder in the Cathedral was first staged in Canterbury Cathedral in 1935. This verse drama is based on the events leading to the murder in Canterbury Cathedral of Thomas Becket, Archbishop of Canterbury, in 1170. It was written at the prompting of Bishop George Bell, a friend of Dietrich Bonhoeffer. The dramatisation in this play of opposition to authority was prophetic at the time, for it was written as fascism was on the rise in Central Europe. The principal focus of the play he is on Becket’s internal struggles. 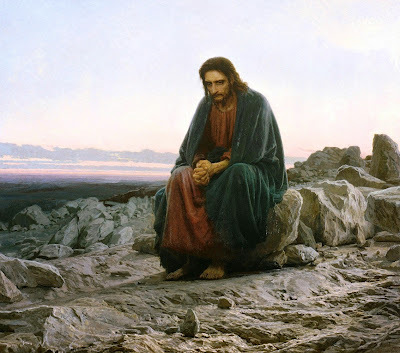 As he reflects on the inevitable martyrdom he faces, his tempters arrive and question the archbishop about his plight, echoing in many ways Christ’s temptations in the wilderness when he has been fasting for 40 Days. In the Gospel stories of Christ’s temptations in the wilderness (Matthew 4: 1-11; Mark 1: 12-13; Luke 4: 1-13), he is tempted to do the right things for the wrong reason. In each case in this Gospel reading, Christ is asked to be complicit in social sin for tempting, self-centred reasons. Whenever I am tempted to look after my own interests first, there are always consequences – potentially dire consequences – for those around me. In the first temptation, Christ is invited to take control of the essentials of life for his own personal comfort and gain. He is asked to prove himself by turning the stones into bread. He is asked to take control of nature and the environment and to use them to meet his own personal need for food. The consequences of looking after my own needs when it comes to the supply of food has left us with an abundance of food in northern Europe, both naturally grown and produced food and genetically-modified food. Try to imagine how famished Christ was after 40 days in the wilderness. I get a migraine if I do not eat regularly; I cannot imagine how unbearable life is for those who are hungry on a regular and continuous basis, day-by-day, every day. Desperate people are so willing to do desperate things when they are hungry they are even willing to go against their own better interests. The Children of Israel murmured after 40 years in the wilderness without proper food and shelter. They were so unsettled they were even willing to go back into slavery in Egypt. The fear of hunger allows people to accept structural injustice and unjust societies. Yet, as Archbishop Helder Camara pointed out in his book Spiral of Violence (1971), structural violence is the beginning of all violence. 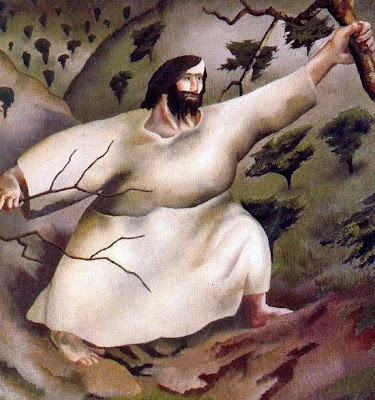 In the second temptation, Christ is invited to take control of sacred and civic space for personal gain. He is taken to the heart of the city and the pinnacle of the Temple and challenged to show that he can command and hold power. How many of our religious and political leaders in our society, in our world, use their political and religious leadership to give themselves power and command, to control, and to guarantee their personal gain? The use of political power for personal gain is so common among politicians today that it makes people cynical and alienates them from the political process. But how often have those with religious power also used their power to protect their own personal interests? From the heart of the city and the pinnacle of the Temple, Christ is then taken to the mountain top, where he is shown all the kingdoms of the world and their glory. Why do these temptations start on the ground, move to the pinnacle of the Temple, and reach their climax on the mountain top? Moses receives the commandments on the mountain top; Peter, James and John witness the Transfiguration on the mountain top; Christ is crucified on a hilltop. The invitation to throw himself from the pinnacle holds no attraction for Christ, who later refuses to come down from the cross. He is not afraid of death. He knows where the true Temple is. Who or what is worshipped in the temple of your heart? In the final temptation, we see the real connection between social sin and idolatry. There is a world of difference between being political in the party sense and being prophetic in the unexpected sense. When I visit people in hospital, I am engaged in pastoral care. When I question why patients are on trolleys, or why we have a two-tier health service in one of the richest countries in the world, I are bringing together pastoral theology and the prophetic call of the Church. But I also run the risk of being accused of being political or, even worse, of being party political. When we greet others with the sign of Christ’s peace at the Eucharist, we are being liturgically relevant. When I ask why the world is not at peace, why hundreds are killed in clashes and wars in Syria, Iraq, Sudan or Afghanistan, I am bringing the liturgy to life in the world, but I run the risk of being accused of being political. In each of these temptations we see the subtle attraction of doing the right thing but using the wrong means. After saying no to each of these temptations, Christ is waited upon by angels (see verse 11). The words in our Gospel passage can also be read as telling us messengers of good news ministered to him, those who proclaim the Gospel served him. At the heart of the ministry and mission of the Church, at the heart of our proclamation of the Gospel and our diaconal service, at the heart of our true worship of God, there is always a call to the Church to minister to and to serve the needs of others in a world that often deprives them of food and shelter, of political and religious rights, and of a true place in this world. This is the ministry and mission Christ was preparing for during his 40 days in the wilderness. This is the ministry we in the Church need to remind ourselves about during the 40 days of Lent. And if we do this, then we can truly live in – and truly invite others to live in – the light and joy of the Resurrection as Easter breaks into our lives. (Revd Canon Professor) Patrick Comerford is Lecturer in Anglicanism, Liturgy and Church History, the Church of Ireland Theological Institute. These notes were prepared for a Bible study in a tutorial group with MTh students on 22 February 2017. I am catching an early morning flight to Stansted and I am spending a full day today [22 February 2017] in London at a meeting of the Trustees of the Anglican mission agency, USPG (United Society Partners in the Gospel). Earlier this week, USPG announced details of this year’s annual conference which is taking place from Monday 17 July to Wednesday 19 July at the High Leigh Conference Centre in Hoddesdon, Hertfordshire. Last year’s conference took place at the Hayes Conference Centre in Swanwick, Derbyshire. This year, the conference returns to High Leigh and looks at how USPG is working in partnership with Anglican Churches around the world to help serve local churches and strengthen communities. In particular, the conference is focusing on five key thematic areas of USPG’s work, namely protecting health, growing the Church, enabling livelihoods, promoting justice and responding to crises. The programme includes talks, workshops, ideas to take back to parishes, and opportunities to meet some of USPG’s world church partners. The speakers include Jo Musker-Sherwood, of Hope for the Future, who is discussing how the Church can engage with the issue of climate justice. Canon Grace Kaiso, General Secretary of the Council of Anglican Provinces of Africa (CAPA), will look at how the Church is working with communities to enable livelihoods. The Revd Dr Carlton Turner, of Church in the Province of the West Indies (CPWI), will be exploring how we might grow the Church. The Right Revd John Wilme, Bishop of Tongoo in Myanmar, will speak about protecting health. The Right Revd David Hamid, Suffragan Bishop in the Diocese in Europe, will speak on the theme of responding to crises. Bookings can be made using an online order form or emailing USPG’s Conference Organiser Kathy McLeish through the USPG website. The conference is free for students, ordinands, USPG diocesan representatives and Journey With Us participants.